We at Korm Plastics safely assume that M.B., also known as Maurizio Bianchi doesn’t need much introduction. In the early 80s he was responsible for a string of compelling electronic music albums in the first wave of ‘industrial music’. After a hiatus of many years he returned in the late 90s and since then has been very active with many new solo releases, but also on the side with collaborations. 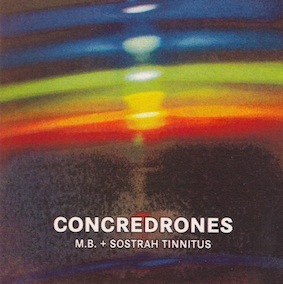 Here he works with Mario Costa, also known as Sostrah Tinnitus, from Italy, who has had a number of releases on labels as Umbra, Beyond, Mystery Sea and Silentes. The music is not as dark as it was in the early years, but has grown into a more complex affair with room for electronic textures and acoustic sounds – hence the title of this album.